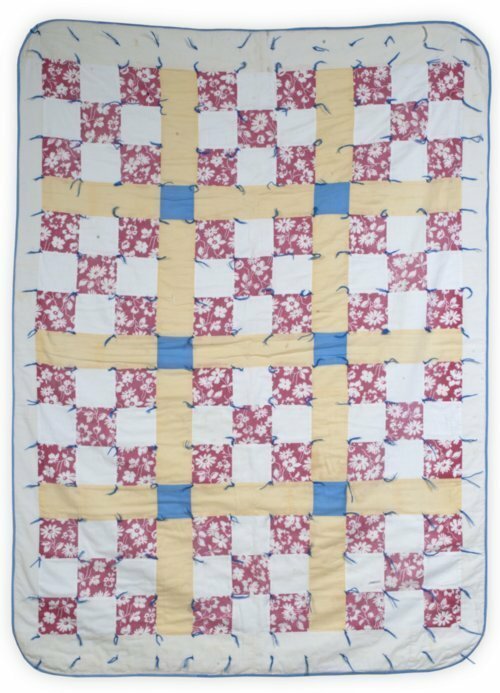 Nine-Patch baby quilt made of pastel cotton fabrics and tied with blue yarn. Top is composed of twelve large blocks of alternating plain white and pink print squares. Separating the Nine-Patch blocks are strips of plain yellow sashing with blue squares where horizontal and vertical sashes cross. White borders. Blue binding. Backing is white and pale pink cotton. Machine-stitched and hand-tied. Dagny Nicholson Aspelin made this quilt for her grandchildren to use while visiting during World War II. Dagny Aspelin emigrated from Denmark to the United States in 1890. She married Albert Aspelin in 1912 and they farmed near Dwight, Kansas. They had 17 grandchildren.